A long line of science fiction classics, including Heinlein’s The Moon is a Harsh Mistress and Arthur C Clark’s Moondust, through to more modern writers like Ben Bova (Moonrise and Moonwar) have focussed on life on a settled or developed Moon. 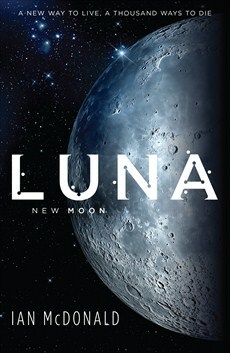 In Luna: New Moon, Ian McDonald brings his hardscrabble, developing-world sci-fi sensibility to the Moon to dazzling effect. As could be expected after books like River of Gods and Brasyl, McDonald’s Luna (as Heinlein also styled it) is no westernised utopia, but rather a heady mix of Asian, European, Caribbean and African influences. Luna has been corporatised and is a major source of raw materials for Earth. It is a highly stratified and monetised society, where even the air you breathe must be paid for and the dead are recycled for the benefit of the living. Under the rule of the Lunar Development Corporation sit five families, the Five Dragons, each responsible for a different aspect of Lunar profit. McDonald’s story focusses mainly on the Brazilian Corta family, the upstart fifth dragon, whose Helium3 operations keep Earth’s lights on. The Corta matriarch has political issues not only within her own family but with her rivals, particularly the Australian Mackenzie family. McDonald’s immersive style and constant shifts of point of view make Luna a difficult novel to engage with initially. But it is worth persevering. The plot slowly ratchets up the personal crises, strategic alliances and corporate skulduggery as McDonald explores his world. As the Joe Moonbeams (new arrivals from Earth) keep being reminded: there are a thousand ways to die on the Moon. And there is plenty of death and destruction in the breathtaking final act which sets the scene for what promises to be a stunning concluding volume.